Last weekend I was back in the district, where I continued to make the rounds talking to constituents. On Friday, I toured Litania Sports in Champaign, which is an outstanding business that manufactures high quality sports equipment for athletic programs around the world. Litania is a homegrown Champaign business has grown exponentially over the years and is a huge local success story. Saturday got started with an outstanding breakfast at the Vermilion Heights Christian Church. Besides helping myself to some delicious biscuits and gravy, I was able to listen to concerned constituents on the current direction of the State. Foremost on everyone’s mind and the greatest concerns stem to the financial viability of the State and the Graduated Income Tax proposal. People are frustrated that there is no spending discipline in Springfield. We’ve been told that next year’s budget deficit is already at $3.2 billion. In light of that, we must start working to reduce that deficit and we must start making reforms to State Government, instead of spending more money and raising higher taxes. In fact, bills have been introduced that at a minimum, create $12 billion in new spending. Of course, not all these bills will pass the House, and some may have merit, but it is indicative of the problem we face in state government. We must get our spending under control before we go back and ask the taxpayer for more money. This is where I have a fundamental disagreement with the Governor and the majority party, reform and restraint before revenue. The weekend wrapped up on a very special note Sunday. I was honored to present a certificate from the General Assembly honoring Emma Carpenter of Gifford for her 100th birthday. It is always an honor to recognize constituents for achievements. I was touched and humbled to be able to participate in Emma’s birthday party. Meeting and speaking with constituents is always one of the most important parts of this job. 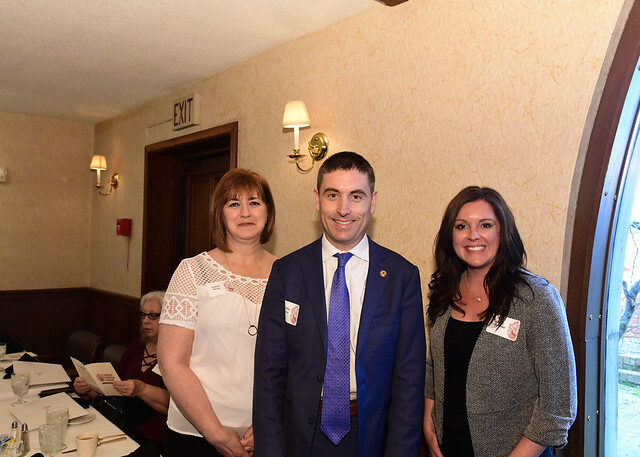 On Tuesday morning, I had the opportunity to welcome two women from the 104th district to Springfield for our inaugural House Republican Caucus Women’s Brunch. The purpose of the brunch was to honor two outstanding women recognizing their contributions to our district and to start a dialogue on important issues with those leaders. My invited guests were Laura E. Weis and Katie Osterbur. Laura E. Weis is President and CEO of IOM and ACE and the Director of the Champaign County Chamber of Commerce. Katie Osterbur is the Executive Director of Peer Court of Vermilion County. It was a pleasure to invite two dedicated people that do a tremendous job making the 104th District the best it can be. Katie Osterbur has been working to improve the lives of young people in Vermilion County for years through the Peer Court program. Peer Court is a highly successful diversion program for young people in Vermilion County. Despite challenges finding revenue, there is an overwhelming need in our community. Peer Court, under Katie’s leadership, functions at a high level that is making a serious difference in the lives of many of our at-risk young people. Laura E. Weis is the leader of one of the State’s best Chamber of Commerce. 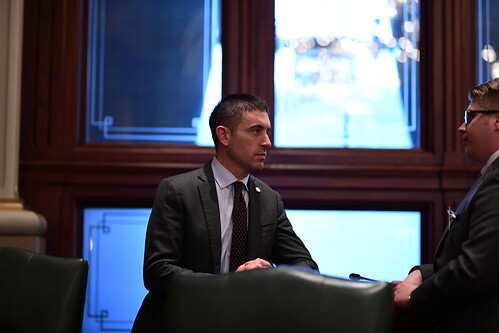 Despite the challenges of economic development in Illinois, the Champaign Chamber always operates at a highly effective level representing the best interest of business owners. Under Laura’s leadership, the Chamber has developed innovative solutions to address serious challenges that Champaign County businesses face. Work force development is a top priority, and Laura’s foresight has led to numerous program creation for the long-term success of Champaign County. The educational needs in the workforce start at the elementary school level is major initiative being spearheaded by Laura. These efforts will keep Champaign County as a Statewide leader in economic development. I am extremely proud of both of my constituents, Katie and Laura, and was excited to introduce them to my colleagues. I appreciate their participation and their valuable input on what we need to do to improve lives in the 104th District. This week was extremely busy for me in Springfield as it was the deadline week to get bills passed on third reading. Third Reading deadline in the House means we voted on hundreds of bills throughout the week, and while many of the pieces of legislation presented before us are rather innocuous and pass without much debate or opposition, there were dozens of bills this week that required the state to spend more money. Despite running here and there, I had several big highlights of the week. On Wednesday, the Danville Boys and Girls Club stopped by to visit with me. I was proud to meet an outstanding young leader representing the Club, Isaiah Loyd, a senior at Danville High School. It is always good to see young leaders at the Capitol and I was very happy to meet Isaiah. 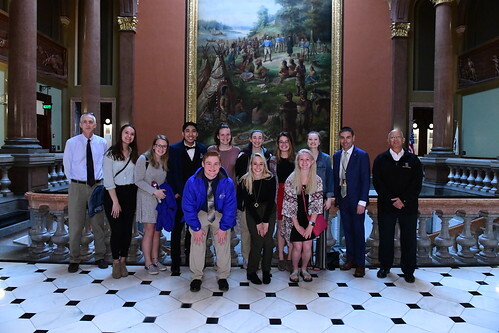 Continuing the theme of outstanding young leaders, awhile back I met with a great group of students from Danville High School and Schlarman Academy. They are a part of my Student Advisory group to gain their opinions on the issues we face in this State that are important to them. The students from Schlarman made the trip over to see me at work on the floor. I was thrilled to have them at the Capitol and despite the busy schedule we were able to carve out a few minutes for a good visit and some Q and A. The young people in our community continue to inspire me and reassure me that the 104th District has a bright future. It also motivates me to make the right decisions that will allow them opportunity here in East Central Illinois. These young people are our greatest asset and we must do right by them. 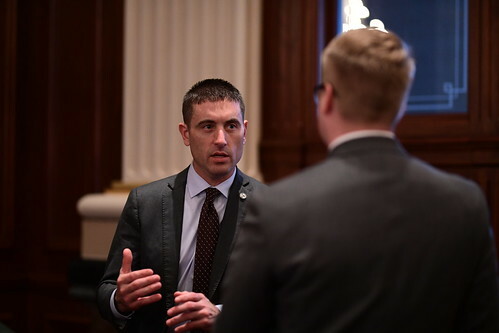 As we enter the homestretch for the Spring Session and get ready to tackle the big issues in the month of May, I am reenergized with the constituents that continue to visit me, contact my office, and let me know the things that matter to them. More challenges lay ahead, but together we will meet them head on.